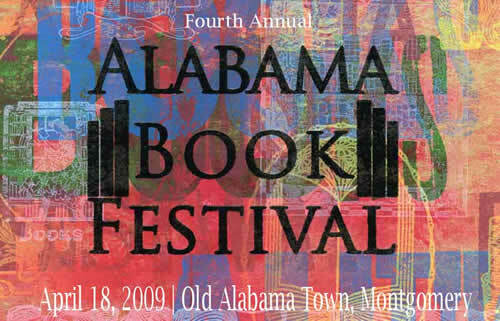 On Saturday, April 18, more than fifty fiction and nonfiction writers, poets, artists, illustrators, playwrights, and children’s writers will converge on the grounds of Old Alabama Town for the fourth annual Alabama Book Festival (ABF). The state-wide literary event will kick off readings and activities at 10 a.m. and go until 5 p.m. The event is free and open to all. This year’s festival will include readings and signings by Harper Lee Award and Pulitzer Prize winner Rick Bragg, Alabama’s beloved Kathryn Tucker Windham, acclaimed photographer Beth Maynor Young, and chef Frank Stitt. A dedicated children’s area will feature Magic Tree House author Mary Pope Osborne, among others. Again this year, the Alabama Writers’ Forum will sponsor the Poetry South/West Tent on the grounds of its Haigler House headquarters. A special concluding event from 4 to 5 p.m. will feature the national debut of Warren St. John‘s new book, Outcasts United: A Refugee Team, An American Town. April is National Poetry Month. Celebrate at events such as the Alabama Book Festival, the Montevallo Literary Festival, the Limestone Dust Poetry Festival, and the Alabama Writers Symposium.